The new Snom D375 VoIP phone is here and VoIPDistri.com starts selling! Voice over IP Distribution VoIPDistri.com expanded a wide range of new functions and features with the new Snom D3 series, this starts with the Snom D375 SIP phone. VoIP phone manufacturer snom technology a leading provider of IP telephony and mobile DECT for businesses, is the world all about greater efficiency in the office everyday. Snom trumps the new Gigabit generation with the development of the legendary Snom 300 series launches Voice over IP Distributor – VoIPDistri.com selling the new D3xx phone series (D300 / 305 / D345 / D375 and D3 keyboard extension). VoIP phone manufacturer snom technology a leading provider of Asterisk Compatible SIP terminals stands all about greater efficiency in the office everyday. Dedicated keys provide direct access to the functions for audio and call control. Context-sensitive menus offer additional options, depending on what you need. The graphic display can be swiveled so that you can set your favorite reading angle. When premium phone D375 a powerful Broadcom chipset is installed and provides Full HD telephony in conjunction with a DSP (Digital Signal Processor) for excellent voice quality on the handset and via the speakerphone. In addition Snom has two Gigabit Ethernet ports with VLAN (Virtual Local Area Network) integration donated. About The LED signal lamp above the display incoming calls are signaled visually. The 4.3 “large TFT color display can be swiveled so that you can set your favorite reading angle. In addition, the built-in Bluetooth interface and USB port allow the use of accessories like USB or Bluetooth headsets and Wi-Fi sticks. When Snom D375 speaker can be switched on even during a call via the handset or headset at any time, to allow monitoring. The flat design allows particularly comfortable dialing. Extremely practical and comfortable, the separate buttons for the ten most commonly used features, including last number redial, call forwarding, conference call and DND are (“do not disturb”), in addition, up to 12 different SIP accounts and is with the new snom D3 expansion module 18 programmable multi-function buttons for individual labeling expandable by an additional 3 keypads. A built-in HTTPS (S) server, the Snom D375 is via a secure data connection configurable and password protected via XML browser, telephony encrypted via TLS, SIPS and SRTP protocol connection. 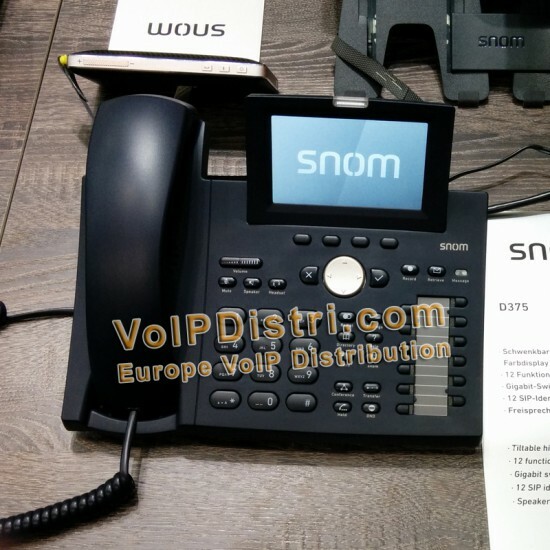 The new Snom D375 is now at Westphalian Voice over IP Distributor in germany – commercially available VoIPDistri.com and is ordered online via Direct Link.